The old adage “you get what you pay for” generally stands true, but every once and awhile you can beat the system and get a real deal. This list of the best exercise bikes of 2019 for under $200 is my proof. In the fitness equipment world, getting anything of quality for under $200 is a real steal. Luckily for us, this year there are some really affordable exercise bikes out there that are actually worth buying. But beware, there is a lot of junk out there too. To ensure you steer clear of that and don’t waste your money, I’ve included a few suggestions of what you should look for (and compare) between budget exercise bikes before making a decision. Budget exercise bikes are smaller than more expensive models. This rule might not be written in stone, but it is generally the truth. This is one reason why these bikes are cheaper to begin with. If you are a tall individual (over 6 feet), you especially need to check and make sure you will be able to ride the bike comfortably. Some budget bikes have a hard time accommodating taller users. Quality budget exercise bikes should accommodate most users between 5’3″ and 6’4. Some models are a little better than others for the bigger folks. Weight limit goes hand in hand with the size concern above. Cheaper exercise bikes usually have lower weight capacities as well. Always, always, always double check the weight limit of a bike before purchasing. Not only do you want to make sure the bike can safely hold you, but weight limit gives you an idea of how well built the product is. When stuck between 2 models, always go with the one with the higher weight limit. I like to see weight limits of at least 300 lb, although there are a few bikes on the list that fall a little shy of this goal. Keep in mind our price range here- if a bike that costs less than 200 bucks can hold a 300 lb user, I would say that’s impressive. Exercise bikes in the under $200 category may or may not offer a warranty. If they do, they are generally a 90-day warranty or perhaps a limited 1-year warranty. I would suggest choosing a bike that does offer a warranty because it shows the manufacturer is willing to back up their product (even if it’s a really short warranty). Just don’t expect the budget machines to offer the same kind of warranties the high end products offer… not gonna happen. Most of the models that made this list do have warranties ranging between 1-3 years. Again, I do suggest you try to find a bike that does offer a warranty- remember, anything is better than nothing. This might be kind of a no-brainer, but always check the dimensions (footprint) of the bike before purchase. Even though these bikes tend to be smaller, you want to make sure you have enough space in your home for it. I encourage you to check the dimensions and then measure out that space on your floor to see how it fits. Make sure you add in a foot or so in each direction to ensure proper comfort. Some of these bikes are foldable, which is great if space is limited. If your exercise space is tight, look for a bike that can fold away for storage when not in use- it can make all the difference in the world when space is REALLY limited. Budget exercise bikes won’t be able to offer as many bells and whistles as their more expensive counter-parts, but some do come with more advanced features. Most exercise bikes in this price range will come with a basic LCD display screen. Some will come with a grip heart rate (HR) monitor as well. Don’t expect bluetooth connectivity or advanced consoles with user profiles and workout programs in this price range. Unfortunately, we have to pay a little more for these features. In this price range, you want to make sure seats are adjustable and that the bike can be easily moved. Most exercise bikes in this price range are lightweight and do have transport wheels, so mobility isn’t typically an issue. The Exerpeutic Gold 500 XLS is topping the list for upright bikes because of it’s durable construction and ability to accommodate larger users. These are qualities most budget exercise bikes can’t offer. This heavy-duty bike by Exerpeutic is capable of holding riders up to 400 lb and up to 6’5″ tall. This is great news for the big and tall users looking for an affordable bike. The Exerpeutic Gold offers 8 levels of adjustable resistance that is controlled by turning a dial. Most users report the resistance is sufficient enough to get a solid workout. Just make sure you pay close attention to the instructions when assembling the wiring component for the resistance- some users complained this part is a little tricky. As you might have guessed from the bikes name, this machine does fold in half for easy storage. This is a nice perk if you are looking for a bike to fit in a small space. The bike only weighs about 50 lb and comes with built-in transport wheels, so moving this machine shouldn’t be an issue. Exerpeutic put an over-sized, cushioned seat on this bike to increase comfort during use. A common problem with all exercise bikes seems to be the uncomfortable seat. I know, I own a spin bike and had to put a gel cushion on the seat because of how uncomfortable it was. The larger seat on this model should help. The Exerpeutic Gold 500 XLS does come with a simple to use LCD display monitor and a grip heart rate monitor. These features make it easy to track stats like time, distance, speed, and heart rate during workouts. This bike does have a 1-year limited warranty. This is nice because many exercise bikes this affordable don’t. Overall, the Exerpeutic Gold 500 XLS Foldable Upright Bike is the perfect choice for larger individuals looking for an affordable bike. It’s built stronger than any other bike in it’s price range and can adjust to accommodate users up to 6’5″ tall. It also folds away for easy storage. User reviews are overwhelmingly positive, this bike currently has an average rating of 4.3/5 on Amazon. This folding upright bike by Exerpeutic earns its way to the top of every “affordable best of” list. This is because this bike offers a lot of perks and comes in well under the $200 limit we set for ourselves. As the name mentions, the Exerpeutic folds in half for easy storage when not in use- perfect if you live in a small apartment or home with shared exercise space. The Exerpeutic Folding Upright Bike has an impressive 300 lb weight capacity. Not quite as heavy-duty as it’s big brother mentioned above, but still really impressive considering this machine only weighs about 40lb. Keep in mind though, that this bike states it can only comfortably accommodate riders with heights between 5’3″ – 6’1″. You will appreciate the over-sized seat on this bike, especially during those longer rides. The large seat makes it more comfortable to sit on- a common problem among budget and high-end bikes alike. In terms of features, the Exerpeutic does have a small display screen that shows time, distance, calories, speed, and heart rate. Yes, this bike does have a grip heart rate monitor. It also has 8 levels of magnetic resistance and built in transport wheels to allow you to easily move this bike from room to room. Exerpeutic is offering a limited 1-year warranty on this bike. For this price range, this is pretty decent. Overall, the Exerpeutic Folding Upright Bike is hard to beat in this price range. It has an impressive weight capacity and can easily fold away for storage. Just make sure you aren’t too tall to comfortably ride it. This is one of the most popular exercise bikes online- it’s currently boasting an average user rating of 4.3/5 on Amazon with over 5,000 reviews. This upright exercise bike by Marcy comes very highly rated by users (sorry, no image available). This exercise bike falls well below the $200 limit (it’s actually the cheapest upright bike on this list) and is well built for the price. And not that this matters (much), but the Marcy Upright Bike is one of the more cosmetically appealing exercise bikes in this price range. Marcy has made a name for themselves producing very affordable, quality exercise machines. I’m a big fan of their spin bikes, which we will get to soon. This upright bike has a weight capacity of 300 lb- again, this is pretty good considering how light weight the frame is, but not quite as impressive as Exerpeutic Gold. Another great feature of this exercise bike is its adjustable seat height. The manufacturer doesn’t list the height accommodations, but reviews indicate it can comfortably seat users between 5′ -6′ 4″. Most of us will fit within this range. Some users complained about some wobbling during use even though they were well below the 300 lb limit. 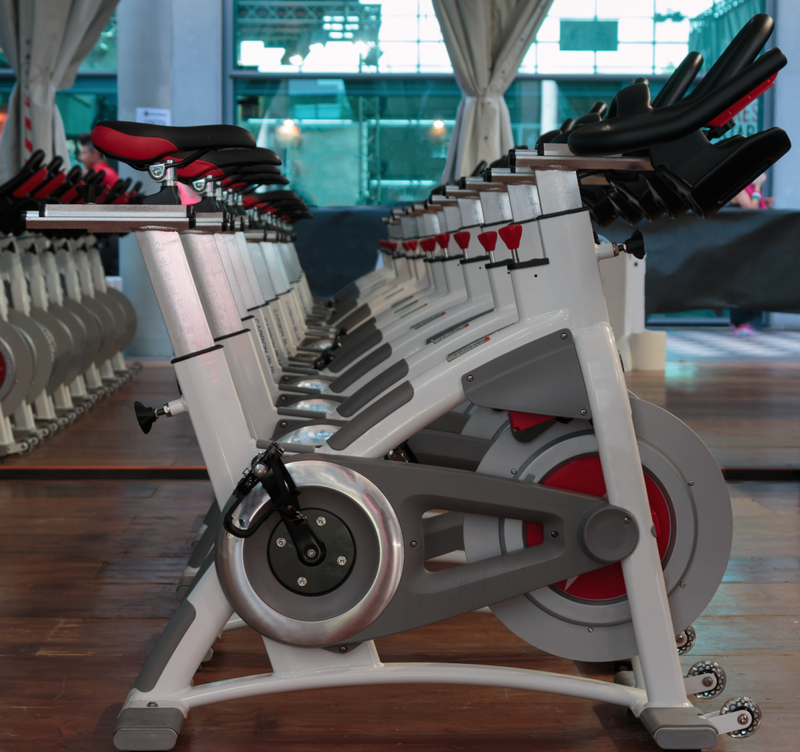 The Marcy Upright Bike has 8 levels of manual resistance. You turn the dial to increase or decrease resistance. This models also comes with a small LCD display screen for viewing your workout stats. Pretty standard stuff here. I like that this bike has large, foam covered handlebars. I never would have guessed until I started cycling regularly, but your hands can actually become uncomfortable from placing pressure through the handlebars. This extra foam padding will make your hands and wrists feel better during your workout. This bike does not include a grip heart rate monitor. It also doesn’t fold. The footprint for this bike is pretty small, and it’s easy to transport with the included wheels. But if you are interested in monitoring your HR during your workout, I would recommend another bike. Overall, the Marcy Upright Exercise Bike is a solid exercise machine and priced well. It’s biggest downside is the fact that it doesn’t have a heart rate monitor. I really see no reason to choose this bike over the Exerpeutic Gold, unless you like the way it looks (I admit, it does look better). Users are happy with this bike though, it currently has an average rating of 3.9/5 on Amazon. Sunny Health and Fitness is another company that has made a name for themselves producing really affordable fitness equipment. Their spin bikes are my favorite product they provide. Their bikes are super affordable and always tend to have slightly more impressive specs than the competition. This is all true for the SF-B1001 Indoor Cycling Bike of theirs. I’m going to start right off the bat with this bike’s biggest flaw- it’s weight capacity. The SF-B1001 only has a weight limit of 220 lb. I know that is ridiculously low. This bike will not work for larger riders. Unfortunately, most of the spin bikes in this price range have pretty low weight capacities, much lower than the upright bikes we discussed above. I think the rest of this bike’s pros outweigh this con. Let’s follow up with the Sunny SF-B1001’s biggest redeeming quality- the flywheel. If you recall from the intro, flywheel weights are important for spin bikes. Most folks prefer heavier flywheel weights because they make the bike feel smoother and more natural during use. The B1001 comes with a 30 lb flywheel. This really impressive for a bike under $200. The SF-B1001 also comes with a fully adjustable bicycle seat- height as well as fore and aft (forward and back). If you are unfamiliar with riding, you should know that standard bike seats are not that comfortable. They take some getting used to. You may want to get a gel cushion overlay if it’s too uncomfortable. The resistance is increased or decreased by turning a knob. A felt pad pushing against the flywheel provides the resistance. This is common for budget spin bikes. More expensive bikes will be electronically managed with magnetic resistance. This bike also has built-in transport wheels and is pretty easy to assemble. It comes with a water bottle holder. The SF-B1001 does not have a display. Some spin bikes do, some don’t. Even a lot of the high end spin bikes don’t. Something to consider- if you want a display for seeing time and calories, you may want to consider the next bike. Overall, the Sunny SF-B1001 is a great spin bike for a great price…if you fit within it’s weight limit. This bike is definitely better suited for smaller riders (height below 6’1″). With the heavy flywheel you will enjoy a smooth ride. Users are very happy with this bike, it’s currently rocking an average rating of 4.1/5 on Amazon. The Merax Fitness Indoor Cycling Trainer is an affordable spin bike designed for bigger riders. This bike offers a 330 lb weight capacity which is unheard-of in this price range. This shows that this bike is designed tough and well constructed. That, in combination with the fully adjustable seat should make this bike a great choice for taller individuals. The Merax Indoor Cycle also comes with an LCD display. This is a nice addition if you like to monitor time and distance stats. Many spin bikes (even more expensive ones) don’t include monitors. This spin bike has a little extra padding on it’s seat. Some users report this helps, others don’t notice a difference. The unfortunate fact is that spin bike seats are uncomfortable and take some getting used to. But, if you want to purchase an upgraded seat on your own, it’s easy to switch out the seat on these spin bikes. The Merax Indoor Cycle has a 22 lb flywheel. Not as heavy as the SF-B1001, but pretty good for a budget cycle. This should still be enough weight to provide a nice, smooth ride. Tension is controlled the same way via turning a knob, which also can be pushed to act as a brake for stopping. On paper, this bike may appear to have more going for it than the SF-B1001. It certainly has a better weight capacity and it includes a display monitor (and it’s cheaper). Unfortunately, a lot of users have complained about faulty parts or parts wearing down quickly. There’s also no talk of a warranty on this product, that’s why this came in at number 2 on the list. Overall though, users are happy with the Merax Indoor Cycling Trainer. It’s a heavy-weight spin bike with a display and a very affordable price. It has a flywheel heavy enough to provide a smooth, quiet ride. This bike is currently boasting an average user rating of 3.9/5 on Amazon. This spin bike is very similar to the SF-B1001, but with a few noticeable downgrades. First of all, this bike only has a 22 lb flywheel. This isn’t bad for a bike of this price, but it won’t feel as comfortable as the 30 lb flywheel. Also, you will notice a big difference in the handle bars- these aren’t adjustable. This indoor cycle is less adjustable- this means it won’t fit as many people as comfortably. The weight capacity is the same on this spin bike, still 220 lb. This is lower than I would like to see, but if you are of smaller size, you shouldn’t have any issues with riding this bike. Again, this cycle is not designed for big or tall folks. I wouldn’t suggest purchasing this bike if you are over 6′ tall. The seat is adjustable, both in height and fore/aft. The seat on this model is a little larger than standard, which might help a little in terms of comfort, but if you are looking for a seat that mimics a road bike you might be a little disappointed. This indoor cycling bike does come with an LCD display screen, which is a nice addition. This gives you the opportunity to track your time, distance, and calories. You’ll also notice that the warranty on this bike is significantly reduced compared to the SF-B1001. A 90-day warranty is pretty useless. If you can only back your product up for 90-days, that says a lot. Better than no warranty though, I guess. I guess we need to remember the price range we are in here too. Overall, the Sunny Health and Fitness Indoor Cycling Bike is a decent buy for the price. But there is no reason to choose this one over the SF-B1001 unless the extra $60 is a deal breaker. That said, users are overall very happy with this bike. It’s currently rocking an average rating of 4.1/5 on Amazon. Yes, you can even get recumbent bikes for under $200… I know, pretty cool. Recumbent bikes are popular because they are more comfortable to sit on and put a little less stress through your joints. This type of bike works great for seniors too. The Exerpeutic 900XL is at the top of our list because it has a solid weight limit, includes a HR monitor, and even has a warranty. The Exerpeutic 900XL has a max weight capacity of 300 lb. This is pretty decent for a recumbent bike under $200 and that only weighs 63 lb. This bike has an adjustable seat (horizontally) that helps it accommodate people of varying heights. It should be able to accommodate users from 5’3″ up to 6’3″ fairly comfortably. The Exerpeutic 900XL has 8 levels of resistance. This is adjusted by turning a knob, very similar to most of the bikes discussed thus far. There were several complaints from users about having to readjust the resistance knob after assembly because it was too difficult at the lowest setting. This seems to be more of an assembly issue because there have also been some complaints about having a hard time following the directions. This bike comes with a pretty standard LCD display screen that shows all the typical metrics you’d expect. There is a grip heart rate monitor in the handles which will give you an idea of how hard you are working. It also has a set of little handles on the console in case you want to switch your handgrip up. A nice touch for added comfort. There is some confusion online regarding the warranty on the Exerpeutic 900XL. According to Paradigm (the supplier), the 900XL has a 1-year warranty on the frame and a 90-day warranty on parts. Overall, the Exerpeutic 900XL Recumbent Bike is a solid bike for the price range. It has a good weight limit at 300 lb and the seat can adjust to fit most users comfortably. The warranty is short, but we should expect this on budget bikes. Just make sure you are careful with assembly, this is where most complaints arise. That said, this is a highly popular bike. The 900XL is currently rocking a 4.2/5 average user rating on Amazon with well over 2,000 reviews. This recumbent exercise bike offered by Marcy is very similar to the Exerpeutic 900XL. The biggest difference is that this bike doesn’t have a heart rate monitor and it costs a little less. It also has a better warranty on the frame. The Marcy Recumbent Bike also has a 300 lb weight capacity and should be able to accommodate riders up to 6’6″. This bike is a little lighter than the Exerpeutic at around 60 lb, so moving it should be a piece of cake with the transport wheels. This recumbent bike also has 8 levels of adjustable resistance. Adjust by turning the resistance knob. This bike has fewer complaints regarding the resistance tension. There was one complaint about the resistance being too easy until you get to the last couple levels. This bike also comes with an LCD display screen that shows speed, distance, time, calories, and an odometer. The only thing missing is the heart rate monitor. If you don’t care about monitoring heart rate, or you already own a heart rate monitor, this may be a good choice because this model is a little cheaper than the Exerpeutic. Marcy offers a 2-year warranty on this bike’s frame. Not bad for a bike well under $200. The seat on the Marcy Recumbent bike is pretty large with oversized handrails. This seat is going to be more comfortable than that of a spin bike, but it’s not going to feel like a higher-end recumbent bike you see at the local gym. Just a warning, these “padded” seats still aren’t that comfortable. Overall, the Marcy Recumbent Bike is a nice choice if you aren’t worried about having a heart rate monitor. It has the same weight capacity as the Exerpeutic and a better warranty (as well as a better price). This bike is also very popular online. The Marcy Recumbent bike is currently boasting an average user rating of 4.1/5 on Amazon with over 2,000 reviews. Coming in number 3 for our recumbent bikes is the Merax RB1020. The RB1020 made the list for its impressive weight capacity, its warranty, and the ease of which the seat can be adjusted. It also comes in well under our $200 ceiling which is always nice. The Merax RB1020 has a weight capacity of 380 lb. This is very impressive, however there is a note online stating the manufacturer recommends a lower weight capacity (242 lb) for prolonged use. This is kinda strange. Basically they’re saying that the bike can hold a 380 lb person, but it’s not going to last with this size of user? Hmm… Well, I guess they are being honest. If you are a bigger user and are nervous about this, Merax does offer a 3-year warranty on the frame and a 90-day warranty on parts. If that helps any. This bike has the same 8-level resistance knob as the other 2 recumbent bikes mentioned. I like that this bike has a more convenient seat adjustment though. This seat can be adjusted while you are actually sitting on it, most of these bikes are easier to adjust without you on it. Merax included a lever that can easily be used to slide the seat forward or backward. This bike should be able to fit users between 5’2″ and 6’5″. The Merax RB1020 also comes with an LCD display screen and a grip heart rate monitor. The display shows all the same metrics we’ve discussed above. Users are very impressed with how easy assembly is on the Merax. Assembly is where a lot of cheaper bikes get dinged, but surprisingly, the Merax is very easy to put together. Overall, I like the Merax because it has a very high weight capacity and the seat is very user friendly. It also offers one of the best warranties I’ve seen on a budget machine. This bike would be a good choice for larger individuals looking for an affordable recumbent bike. The Merax RB1020 is currently boasting an average user rating of 4.3/5 on Amazon. I’d like to start by saying that finding a real air bike for under $200 is tough. High-end air bikes are found in the $600-$900 range and can provide a world class workout with the unlimited resistance offered by the fan. Most of the air bikes in the under $200 category are hybrids and aren’t real fan bikes. There are several that have a fan in the front, but still have a resistance dial- a true fan bike doesn’t need a resistance dial. Luckily, Sunny Health & Fitness is offering the Zephyr Air Bike. This is a true air fan bike because the resistance is actually provided by the fan cutting through the air. This is great because the harder your pedal, the more resistance you get. There really is no limit to how much resistance you can get- the only limitation is your strength and endurance. Back to the Zephyr (cool name by the way). This fan bike has a 240 lb weight capacity. This isn’t as impressive as some of the numbers we’ve seen above. But in this price range, this is what we get for fan bikes. Larger folks are going to have save up a little more for a more heavy duty bike unfortunately. The Zephyr Air Fan Bike does have an adjustable seat (height). It also has an LCD display screen for viewing time, speed, RPM, distance, and calories burned. There is no heart rate monitor on this bike. Actually, most fan bikes don’t have a HR monitor. The handrail arms are also adjustable on this bike, a convenient feature to help ensure a comfortable fit for more users. The seat is large and padded as well, for added comfort. Overall, the Sunny Health & Fitness Zephyr Air Fan Bike is as good as it gets for under $200. I like this company and they are known for producing pretty solid, affordable equipment. This bike should work well for smaller users or folks looking for an intro into the air bike game. Larger people, or elite athletes will need a more robust bike. Yeah, sorry, only one air bike made the list. I can’t vouch for a “fan bike” that needs a dial to adjust the resistance. That just defeats the purpose. A real fan bike only needs, well, a fan. These bikes have become increasingly popular again when Crossfit athletes started using them in their workouts. Crossfit athletes are some of the fittest people in the world and they workout with air bikes because of the unlimited resistance potential. I imagine a lot of companies are trying to cash in on their popularity by offering budget products that look like the fan bikes we see on tv and in local gyms. I mentioned that the high-end fan bikes run in the $600-$900 range. Although there really aren’t a lot of options for under $200, there are several more options once you hit $300. That might be a good topic for a separate post. We started with a few tips on what to look for when comparing budget exercise bikes and then took a look at the 10 best exercise bikes 2019 has to offer for under $200. I know it feels like everything is expensive these days. But looking at this list of bikes, I get excited to see that there still are good deals to be had… if we look in the right places. Regardless of the type of bike you are looking for, there are options in the under $200 price range. Upright, spin, and recumbent bikes can all be found in this price range. Finding a true air bike for this price is difficult, but the Zephyr should work nicely if you fit within the weight limit. If you have realistic expectations, you can be happy with budget exercise bikes. Keep in mind that these bikes will feel different from the high-end equipment you see in gyms and rehab facilities. After all, those bikes cost more for a reason. Knowing what to expect really makes all the difference in the world. But I hope this list also showed you that affordable bikes can have something to offer. After all, a lot of these bikes come with 300 lb weight capacities and higher- to me, that’s amazing considering the price range. And if one of these bikes gives you the ability to exercise more from home, or even cancel a gym membership, then I would say that is true value. I hope this article was helpful. If you have any questions or concerns (or know of another affordable bike that shouldn’t made the list but didn’t) please leave them below and I’ll get right back to you. The Bowflex 5.1S Stowable Bench – The Best Weight Bench For Small Spaces? WOW, your post is so interesting and well written that It made me check your whole website! Loved it! Especially the nutrition page! It would be great if you add a healthy nutrition post or page. Keep up the great work!! Thanks for the kind words, I really appreciate it. Keep an eye out for a new nutrition post, it should be coming out soon. I appreciate all the information you provided. However, I still think you get what you pay for. These are ok for simple cardio bikes, but I don’t see any way to do HIIT with these. That’s what I like to do with my recumbent bike that is obviously heavier and contains tons of built in routines. I think these are really good options for small places and for people on a limited budget. It’s true, you get what you pay for… usually. Most of these budget bikes can’t compete with the more expensive high-end bikes, but that’s why they cost less. Unfortunately, not everyone can afford to pay for the more expensive models. But don’t think you can’t do an effective HIIT workout on these bikes, especially the spin bikes. All you need is enough resistance to get your heart rate up high enough for a HIIT workout, and these bikes are capable of that. You don’t need a bunch of preprogrammed workouts for a HIIT. If you enjoy HIIT, you should check out my latest post. I’m glad it was helpful, thanks for reading.